Life in Motion | Is Your Business in Need of a Chatbot? 07 Aug Is Your Business in Need of a Chatbot? When it comes to keeping your business relevant in today’s high-tech market, it is important that you are always looking for the latest and greatest developments to keep your business ahead of the curve. One of the many things that you may want to consider for your business is a chatbot. 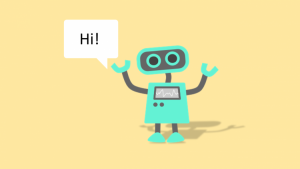 If you haven’t already looked into adding this to your website, the first thing you need to understand is what a chatbot really is. Simply put, chatbots are computer programs that can have real conversations with people. They can be used with virtually any messaging app and are designed to understand both written and spoken messages. For most businesses, their benefit is in looking up and delivering information to users who have questions. Chatbots can help enhance the experience for the customers who come and visit your website, and here’s how. They can answer questions quickly and more efficiently than humans can. Whether you want your bot to automate an order or customer service information, these intelligent systems can help answer questions and provide information for your clients. They can help you scale operations. While a single agent can only handle a conversation at a time, chatbots can handle much more. This is great if your company tends to receive a bunch of questions. You can customize your chatbot to work for you. The best part is, these bots are getting smarter and smarter and can continue to do more for your business. They cater to millennials. Studies show that millennials prefer live chat instead of phone calls, meaning you can better engage with this demographic. If you are looking for a way to help your customers find the right product or service, then you may want to consider chatbots. They can guide your customer in the right direction. Chatbots can simplify specific tasks and help market content online. They can even be used for interactive marketing campaigns. Interested in learning more about chatbots and what they can do for you? Let the experts here at Life In Motion help. We can make sure that you not only understand how to use chatbots for your business but teach you how to integrate them to your website in a manner that will benefit your business.